American Metalcraft, Inc. provides one stop shopping for all of your fabrication and finishing needs. Finishing Dynamics, one of the largest paint lines in the Southeast with a processing window of 4′ wide x 5.5 high x 40′ long. 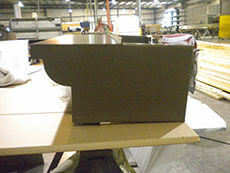 We provide value-added services including sub-assembly for fabricated products. By designing out all production inefficiencies, Finishing Dynamics consistently has a competitive edge over other facilities. We encourage all of our customers to visit our 75,000 + facility. Please call us to schedule a tour. We can fabricate and paint jobs large and small. Above: Buckhead Atlanta rendering. Close up of brake metal for Buckhead Atlanta, painted fluropolymer medium bronze finish.